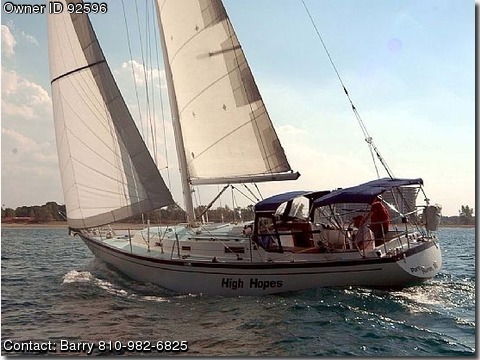 BOAT OWNER’S NOTES: CALL BARRY @ 810-982-6825. The Morgan 38 is a yachting legend, It has proven to be an incredibly solid boat, Her high aspect ratio mast head rig provides superior light air performance, without sacrificing her ability to stand up in a breeze, Her large responsive rudder delivers excellent helm balance while benefiting from the protection of a structural skeg, The Morgan 384 contains upgrades on this design, She does well in the light air of the Great Lakes, and has a double reefing mainsail, controlled from the cockpit, for offshore sailing, She does well at anchor, and has a fold out swim platform from the sealed stern locker, There is a Maxwell stainless steel windlass, double anchor roller, double anchor locker, a deck washdown pump, She does well under power, with a new (2006) 40hp Vetus engine with less than 400 hours on it, and a 3 bladed feathering propeller making her fast at sailing or motoring, She only draws 5 feet, so she can get in just about any harbor. A light and airy feeling is apparent when you go below due to the abundance of opening ports and hatches and the delightful interaction of teak and ash woods, A varnished teak and holly sole is also standard, To insure the privacy of your guests, the home sized head, shower, sink, marine toilet, hot and cold pressure water, is accessible from either the main salon or forward stateroom, A spacious culinary center to port is conveniently positioned near the companionway and boasts a double sink, rainfresh filtered water, Force 10 3 burner propane stove/oven, and a refrigerator/ freezer, Opposite this are a large navigational center and quarter berth, There are 65 storage bins and lockers below! We numbered them all so we could find everything when we cruised extensively. All sail control lines lead aft to the roomy cockpit, This is a boat meant to be sailed, as well as cruised, The decks have a high coaming, making it easy to walk around, The deck was repainted in 2002, when the boat was completely refurbished, We had a marine survey done in 2012, for insurance purposes, as well as for a price quote, so we know what you will get for your money will be well worth it! This is a well maintained boat!